Crédit Agricole......2018Seminar "Poland, a dynamic and open market"
Seminar "Poland, a dynamic and open market"
Credit Agricole Bank Polska was present on March 23, 2018 at the Palais du Luxembourg in Paris, as part of its partnership with the seminar "Poland, a dynamic and open market", organized by Business France and sponsored by the President of the French Senate and the Polish Minister for Investments and Development. The seminar program focused on topics such as the macroeconomic situation and promising sectors in Poland, the investment framework and opportunities for French companies, the practice of business in Poland and market access, as well as the financing of projects and exports. The event provided the participants with information regarding the business environment in Poland, the potential of this market and the development opportunities it presents to French companies. They had the opportunity to initiate a first network of local contacts in view of a potential export or investment project, as well as to meet with French professionals who have been successful in the Polish market. 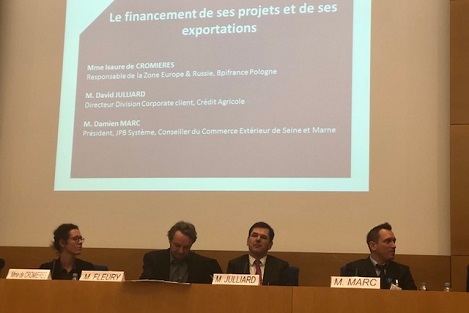 Head of Corporate Clients Division at Credit Agricole in Poland – David Julliard, took part in the debate on the financing of installation projects in Poland. He underlined that for more than 20 years now, Credit Agricole has been supporting its corporate customers in their development projects on the Polish market. CABP, recognized for its quality of service to businesses (CRI nearly 40%), offers individual financing solutions (including structured finance and real estate), cash management, trade finance and capital market.